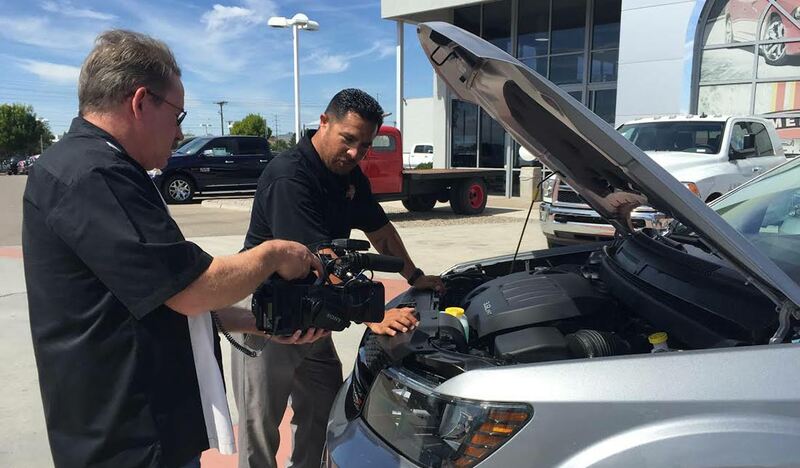 This week at Melloy Dodge in Albuquerque, New Mexico, Edit House Productions filmed and produced our upcoming September TV and radio commercials. Get ready for September savings at Melloy Dodge because they are huge! Listen for us on your radio and watch for us on your TV as we tell you about our new September incentives and promotions. If you are looking for a new 2015 Dodge RAM 1500, 2015 Dodge Journey, or a 2015 Dodge Charger, now is the time to buy! Labor Day weekend is right around the corner too - that means even more savings for you! Celebrate your long weekend at Melloy Dodge by coming down and checking out our great selection of Dodge RAMs to haul your boat to the lake or your travel trailer to the mountains for a long weekend of camping and outdoor fun. Go Lobos! Don’t forget it’s almost football season and that means the kickoff to incredible savings is almost here too. Tailgate in style with a 2015 Big Horn RAM 1500 from Melloy Dodge! Gather all your buddies and take a road trip to a football game in the powerful 2015 Dodge Journey. Also, this month, keep an eye out for our new featured vehicles on YouTube! Join Anthony Martinez as he shows you the best features of the 2015 Dodge Challenger, 2015 Dodge Journey, and the 2015 Dodge Durango in our September “walk-arounds”. Whether you have the need for speed, the need for power for towing, or the need for a family friendly vehicle, Melloy Dodge has a vehicle for you. Come check us out in Albuquerque, New Mexico on Coors Blvd. just north of Paseo Del Norte.